I can remember family shopping trips to Sears on the Boulevard when I was a child. Back in the day, Sears was one of the most reliable retailers for curtains, hardware and many of the other goods that turned a household into a home. Sears on the Boulevard was quite a presence. 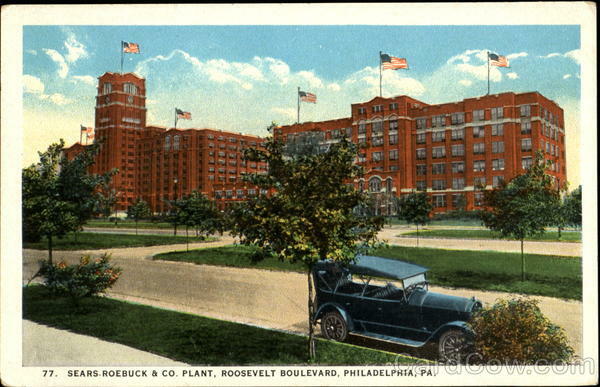 Although most of Philadelphia’s old-school retail temples were located downtown, Sears, Roebuck & Co. opened an outpost on Roosevelt Boulevard at Adams Avenue way back in 1920. Though its first retail store there didn’t open until 1925, its warehouse facility had more than 5 million square feet when it opened—making it larger than the Pentagon. Sears Roebuck & Co. plant on Roosevelt Boulevard. Image courtesy of Card Cow. Sears chose 40 acres of fields at the then-rural edge of Philadelphia as the site of its fourth mail-order house because it was economical—it could ship the most goods to the most people for the fewest dollars. By 1926, 126 U.S. postal clerks worked at the site to handle the mail. Sears on the Boulevard was designed to be a grand neo-Gothic brick building with some style. Citizens who lived in the brick rowhouses that grew up around the landmark never needed a watch since they could simply glance up at its 14-story clock tower to check the time. 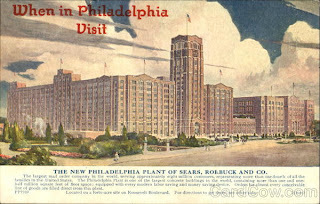 Postcard promoting Sears on the Boulevard as a touring destination. Image courtesy of Card Cow. In 1955, Sears doubled its retail space on the Boulevard when it built a new store at Adams and Whitaker Avenues. At its peak in the 1960s, more than 6,000 people, many from its Crescentville neighborhood, worked at Sears on the Boulevard, a.k.a. “The Mill.” For many Sears workers, the company wasn’t just a livelihood, but a way of life. In the dark ages before online shopping and UPS home deliveries, we often headed to Sears on the Boulevard to pick up my mom's catalog order. I remember that the catalog area seemed like a life-sized version of my Chutes and Ladders game—the continuous loop of hooks that carried paperwork to the back and the large sliding board from which packages would emerge. As Sears, Roebuck & Co. stumbled in the late 1980s, it spun off its most popular departments like hardware into mini stores that allowed it to compete with other more nimble retailers. By 1990, Sears closed the retail store at the site, and staked a claim deeper in the heart of the Great Northeast at Cottman and Bustleton avenues where there was more parking. Not long after, Sears shut down the rest of its operations at the site—the multi-storied building simply couldn’t compete with single-story, utilitarian warehouses by then. In 1994, it took more than 12,000 pounds of dynamite, though only 7 seconds, to implode the clock tower and its 9-story merchandise building. To add insult to injury, when the site was redeveloped, archrival Wal-Mart, who had claimed the crown of nation’s largest retailer from Sears in the early 1990s, joined Home Depot as a tenant in the shopping center constructed on the grave of Sears on the Boulevard. Do you remember shopping trips to Sears on the Boulevard? Did you work at Sears on the Boulevard? Tell us your story in our comments. I do remember shopping at Sears as a kid shopping with mom, going to the catalog pickup area and I also worked for 5 years in the clock tower building on the 2nd floor. Craftman tools, farm equipment and Levi jeans. (1980 to 1985). I shopped played worked and loved Sears on the Blvd. Remember hanging there for hours as a little girl. Could always get shoes or a nice outfit there to wear. Loved the soft pretzels with mustard and the cafeteria which came a bit later. The toy store and santa. Worked there as a catalogue order picker. Those were the days my friend. worked there for 21 years 1969 to 1990 had a great time,met great people,played in sears softball league,team name the demons. aahh still smell the popcorn as you enter the retail store. great memories. Worked there for 21 years 1969 to 1990, played on the softball team different floors had teams. Meet my wife there in 1969, been married for 43 years now " Satisfaction Guaranteed " . Watch the city of Phila celebration of the World Series 1980, from Sears roof. Watch them drop the bomb on move from the Sears roof. Some of the beenies I had being in the maintenance dept . Many trips there to pick up catalog others with my Dad. Sheets meant a soft pretzel! Ah to do it just one more time.